I have been warning about the “Everything Bubble” for the last several years, but the sheer enormity of this global bubble makes it difficult to encapsulate into a single article. As a result, I’ve found it’s easier to examine this bubble by breaking it down into its smaller, bite-sized components. 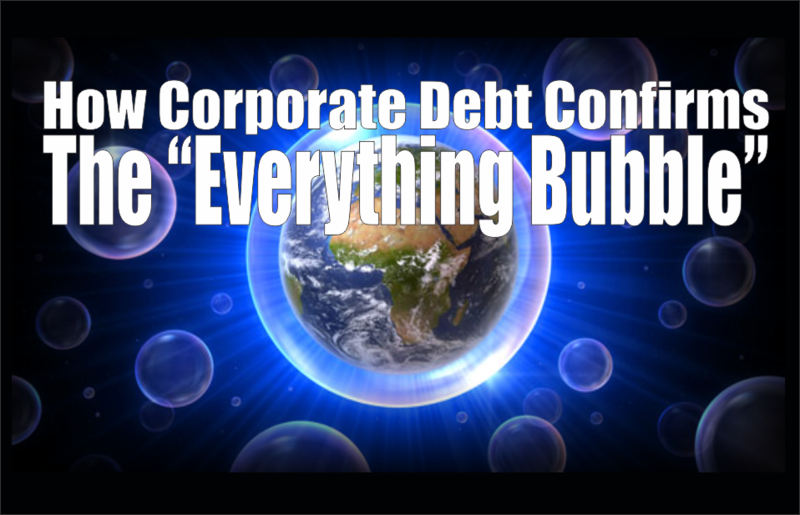 In this piece, I will examine the ballooning U.S. corporate debt bubble, its causes, and how I believe it will end. The starting point of every bubble examination in today’s environment is extremely simple, yet overlooked by the overwhelming majority of economists and financial journalists: record low interest rates. Interest rates (both domestic and foreign) have been trending lower since the early-1980s, but have been pushed to extreme levels by central banks – including the U.S. Federal Reserve – since the Global Financial Crisis in 2008. In order to create an economic recovery, central banks have held benchmark interest rates at artificially low levels and pumped trillions of dollars worth of liquidity into the global financial system and markets. As a result, there has been a world-wide “yield-chasing” boom as liquidity flows into increasingly riskier assets in order to earn a return. Thanks to the unprecedented monetary largess of central banks, U.S. corporations have engaged in a borrowing binge since the Global Financial Crisis. Total outstanding non-financial U.S. corporate debt is up by an incredible $2.5 trillion or 40 percent since its 2008 peak, which was already a precariously high level to begin with. Such a big deal has been made about how much “deleveraging” has supposedly occurred in the U.S. economy since 2008, but there is zero evidence of that to be found in U.S. corporate debt – on the contrary, corporations continue levering up as if the crisis never even happened. Charting the year-over-year percentage change of U.S. outstanding corporate debt shows that there are higher rates of growth during booms and bubbles versus during slowdowns and recessions, which is common sense. Bullish critics may attempt to point out that the corporate debt growth rate is slower in the current expansion than in the prior three expansions, but my counterargument is that the current growth is occurring from a much higher base than even the 2008 peak. Despite the lower rate of change compared to prior economic expansions, the U.S. corporate debt-to-GDP ratio recently hit an all-time high of over 45 percent, which is even more extreme than the level reached during the late-1990s Dot-com bubble and mid-2000s U.S. housing and credit bubble. I believe that the current U.S. corporate debt-to-GDP ratio is even more confirmation of the “Everything Bubble” that I’ve been warning about. At the same time, I’m fully aware that this ratio can climb even higher than in prior bubbles due to the fact that interest rates are even lower now. How have U.S. corporations been deploying their new influx of capital? Unlike in prior cycles – when corporations favored long-term business investments and expansions – corporations have largely focused on juicing their stock prices via share buybacks, dividends, and mergers & acquisitions. While this pleases shareholders and boosts executive compensation, this short-term approach is detrimental to the long-term success of American corporations. The chart below shows the surge in share buybacks and dividends paid, which is a direct byproduct of the current artificial low interest rate environment. Even more alarming is the fact that share buybacks are expected to exceed $1 trillion this year, which would blow all prior records out of the water. The passing of President Donald Trump’s tax reform plan was the primary catalyst that encouraged corporations to dramatically ramp up their share buyback plans. What is even more unwise about the current share buyback mania is the fact that it is occurring at extremely high valuations, which is tantamount to “throwing good money after bad.” Furthermore, these buybacks are being made with borrowed money, on top of it all! This is money that must be paid back some day, lest we forget. The chart of the cyclically-adjusted price-to-earnings ratio shows that the SP500 is hovering near 1929 valuations and is the most overvalued it has been since the late-1990s Dot-com bubble. Reversion to the mean is inevitable. Though U.S. corporations have been ramping up debt to increase dividend payments, dividend yields have remained at record low levels since the late-1990s. I believe that is even more proof that the U.S. stock market is extremely overvalued because it means that stock prices are very high relative to dividends. So, how will the U.S. corporate debt mania play out? Unfortunately, I do not see any way that it can end well. Serious pain is inevitable. I am completely aware that most mainstream economists and financial journalists will try to downplay these warnings by saying things like “it’s different this time” (those famous last words), “interest rates are very low, so it’s not as bad as it seems,” or “corporations are wise to take advantage of low rates to invest in their stock.” As for me, I take the Occam’s razor approach: if it looks like a duck, swims like a duck, and quacks like a duck, then it probably is a duck. There is no doubt in my mind that we are in a central bank-driven bubble. At the same time, I’m not necessarily “calling the top” just yet and I would not be surprised to see U.S. corporate leverage increase even more before the inevitable day of reckoning. I believe that tightening Fed monetary policy will eventually pop the bubble in U.S. stocks and corporate bonds, which will send corporate bond yields much higher. Higher bond yields will put an immediate halt on share buybacks, which will remove an important source of support for the market. In addition, float shrink, or the decrease of shares available for trading (a byproduct of share buybacks) will hurt liquidity, which will exacerbate the coming sell-off. The current U.S. corporate debt binge is even more proof that we haven’t learned our lesson from 2008 and will be doomed for a repeat performance.